With Tish’s co-workers in the dark about her connection to Jeff outside the workplace, she volunteers to attend the funeral on the company’s behalf, but only she knows the true risk of inserting herself into the wreckage of Jeff’s life. 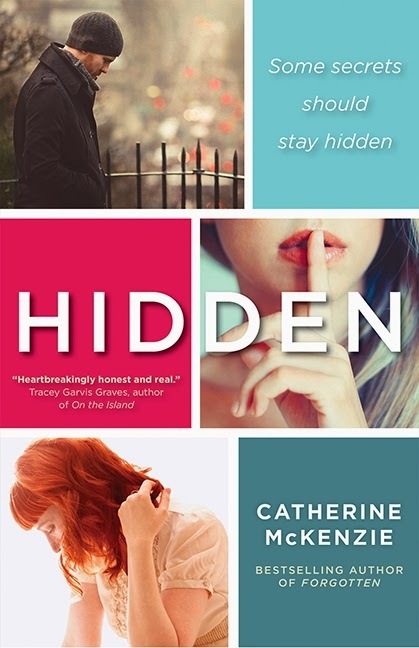 Told through the three voices of Jeff, Tish and Claire, Hidden explores the complexity of relationships, our personal choices and the responsibilities we have to the ones we love. This is a vivid and real peek into the lives of people torn apart by death. The people left behind trying to pick up the pieces, who are never the same again. This story is centered around all the people affected when one person passes. As people, we automatically think of the family, spouses, even friends left behind. But what about if that person leaves a mistress or lover behind? Granted it is a wrong act, but are they not entitled to feel the pain in death? This book goes there. It takes you there and shows you how they feel, and leaves you empathetic. That shows how fantastic and talented the writer is.To bring a reader, like me, into a story with a subject they are dead-set against and yet turn them into an empathetic person, while keeping them transfixed on the book, is talent! I don't agree with cheating and infidelity, and I won't condone it ever, but I can see all sides now. And yes, there is another side. A graduate of McGill University in History and Law, Catherine practises law in Montreal, where she was born and raised. An avid skier and runner, Catherine's novels, SPIN, ARRANGED, FORGOTTEN and HIDDEN, are international bestsellers. HIDDEN, will be released in the US on April 1, 2013. She is currently seeking a new one-word title so she can write her fifth novel. 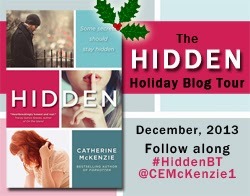 Visit her online at www.catherinemckenzie.com, on Facebook at http://www.facebook.com/catherinemckenzieauthor, and on Twitter at @cemckenzie1. Usually I just have a story in my head that won't leave me alone and I need to write it down. I just always wrote. I never made a decision to 'be a writer.' I did decide to try to write a novel about eight years ago and when that was done then I decided to try to write a good novel. And then get an agent and then get it published. A long road. I took about six months for the first draft. Lots of drafts after that. The middle. The beginning and end are always easy - I know how to start and where I am going at the end, but the middle ... yeah, you can get lost in there. Not really. I can write pretty much anywhere. Hidden is my fourth novel and I'm working on a couple of things that will hopefully be available in the not so distant future. Don't talk about writing, just write. See where it takes you. Always so hard to answer this question! I love Austen. I love Hornby. I love Shawn Klomparens' books. One of my favourite reads this year is a book called The Banks of Certain Rivers by Jon Harrison. Others I've enjoyed recently include Orphan Train by Christina Baker Kline and We Are Completely Beside Ourselves by Karen Joy Fowler. I've been consistent in answering this one: Pride & Prejudice. Bill Bryson (another favourite)'s new book.